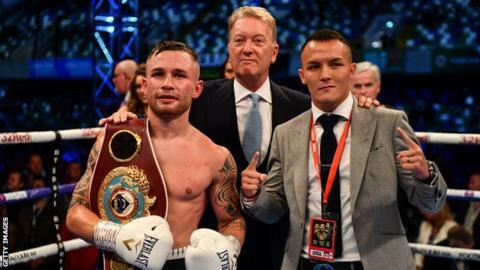 Josh Warrington and Carl Frampton have agreed terms for an IBF world featherweight title fight in December, BBC Sport NI understands. Details are expected to be confirmed next week, with 22 December believed to be the likely date. The 21,000-capacity Manchester Arena is the preferred venue. Leeds native Warrington became the first man from the city to claim a boxing world title with a split-decision win over Lee Selby in May. He was ringside for Frampton's ninth-round stoppage of Australian Luke Jackson at Windsor Park last month. "I have got a lot of respect for him," said Warrington. "But this is boxing and you want to fight the best." The 27-year-old is undefeated in 27 fights since turning professional in 2009. "Warrington is the easiest fight to make at the minute," said Frampton who, like Warrington, is promoted by Frank Warren's Queensbury Promotions. The Belfast fighter, 31, has been without a world title since losing his WBA belt to Leo Santa Cruz in January 2017. On Wednesday, Santa Cruz said he was hopeful a third bout with the Northern Irishman would take place next year. Frampton has expressed his desire for such a fight on several occasions, having won the first meeting between the two in New York. "If I go into the new year with a world title it makes the Santa Cruz fight much easier to make," said Frampton. "Unification fights are always big. It would be a huge fight."